Human beings are naturally curious. The desire to know is intrinsic in us. We often develop a wonder about things that are strange and seek to understand them. While this is largely a healthy trait, it can get out of hand or become abused, thereby endangering the inquirer. You know, like when curiosity killed the cat, ha ha! Sometimes, our probing is motivated by worry. We worry about the likely consequences of problems and mistakes from our past. We worry about our circumstances in the present. And the big one: we worry about what the future holds in store for us. The temptation to see into the future is so great. We feel that if we know what is programmed to happen, we might be better prepared for it or we might be able to manipulate things in our favour. But the problem is that there are so many channels of looking into the future, most of which will get you into trouble sooner or later. There are traditional medicine men, white garment prophets, astrologers, priests of various religions and pastors (to mention but a few) that promise to provide peeks into the future for a fee. The traditional mass media and the Internet are also awash with self-help guides on this matter. In Acts 16, 16-18, a girl with a divination or fortune-telling spirit followed Paul and his companions about in Philippi proclaiming that they were servants of the most high God who had come to show the people the way of salvation. You would think she would be commended by Paul. But the passage says her utterances grieved Paul and he cast the spirit out of her. We can deduce from this encounter that what matters is not how accurate the prediction is but its source. As Christians, our total allegiance and dependence should be on God. When we begin to look to strange powers for help, we are drifting into idolatry and incur the wrath of God. This is what happened to King Ahaziah of Israel when he sent messengers to inquire from the god of Ekron whether he would recover from the grievous injuries he suffered in a fall. Exposure to the dark powers that give these predictions also defile Christians whereas God demands that we be holy as He is. We see this in Leviticus 19:31. We may feel God is being a wet blanket by making these stipulations. And with these esoteric stuff becoming more popular by the day, we may be asking, “What’s the harm in getting a little foreknowledge and the power that comes from it?” The truth is, God is actually trying to protect us from the deception and eventual destruction that comes from fraternising with strange powers. There is nothing harmless in checking horoscopes, peering into crystal balls, palm reading, holding seances, stuff like that. In fact, you can get seriously hurt by dabbling in those kind of things. They open you up to cleverly concocted lies. They tease you with a little semblance of truth and then sell you a whammy. Only God knows with certainty what the future holds, so many predictions from these devious sources often fail. Those who depend on them are courting disaster. That was the case with Ahab who was given bogus assurances of victory in his war with Ramoth Gilead, only for him to be killed there (1 Kings 22:10-12, 30-35). Besides, these attempts to read the future throw people into anxiety, rather than bring peace. You don’t need to know about every danger and trouble ahead. All you need is to trust God. He will keep your heart in peace and fight your battles. What you need is to walk with God in humble obedience. If there is anything you need to know about the future, He will reveal it to you and show you what to do with that information. It may be to pray to avert trouble, to stay away from the devil’s traps, to encourage your heart or someone else. He did it for Abraham and the saints of old. He will do the same for you. Do not indulge in idle curiosity. Do not exchange the freedom that Christ bought for you for slavery to lesser powers. Do not believe you can become a god, Master of your own destiny independent of God Almighty by accessing the future. This is the lie the devil sold to Eve in the Garden of Eden that brought sin and death into the world. Well, you know who told the truth in that case: GOD! Adam and Eve did die and human beings have been dying ever since. That is how it always turns out when you seek counsel from the enemy. He will lead you to disobey God, giving you the impression you can avert the consequences. But you know better than that, don’t you? Whenever your heart is trembling because of the future, remember God’s promises in His word, rest in them and it shall be well with you. Once again, the Lord Jesus says to you: “Let not your heart be troubled:..” (John 14:1). The Lord bless you on every side as you obey Him on this matter in Jesus’ name. Amen. All scriptures above are from the King James Version of the Bible except where otherwise stated. Thanks, Penny, and blessings to you and your family too! Amen! Thank you, Rupnina! Have a lovely weekend and remain ever blessed! God Bless You! Thank you for sharing Gods Blessings! May the Peace of God abide with you for ever! Thank you, my beloved sister! May God crown your year with His goodness in Jesus' name. Dear sister i see fire for holiness in your heart. Yes Lord wants us to be holy for He is holy. God bless you. Praise God, Brother Rao! May God sanctify us through and through and keep us free from contamination by the world in Jesus' name. You are highly blessed, my brother. Yes, it is, praise God! Nedu, you're highly blessed in Jesus' name. Amen and bless you too, Godwin, in Jesus' name. Thank you, Stanley You are blessed! Bless you, Ogechi! You're right. The Bible says the testimony of Jesus is the spirit of prophecy. And as many as are led by the Spirit of God, they are the sons of God. We need to know God personally by receiving Jesus as Lord and Saviour, dwell richly in the word of God and seek the inner guidance of His Spirit as occasion demands, rather than running to the enemy for help. I pray peace upon the saints of God no matter how trying these times may be in Jesus' name. So good. We think we want to know but instead God prepares us along the way. (Because we really don't want to know) Thank YOU! Thank you, Lori! You are blessed! So thankful for God's grace and mercies. Inspiration. Blessings to you. And to you and your family, Laura! Our God is truly matchless in His care for us. Glory to His holy name! It's common with people, my dear. You remember the scripture from the post: "The secret things belong to God..." When you really need to know something, He'll reveal it to you by His Spirit if you are saved or through brethren, etc. but you shouldn't consult esoteric powers. Shalom! Same to you on all counts, my dear! True! It's a matter on which we should tread carefully. Wanting to know the future has become the order of the day. Many families are not in peace because of what some of this white garment prophets and others told them. Our problems basically is that we don't know the word of God. I pray that we realize it's only God that knows the future and focus more on living a righteous life instead .God bless you Aunty for sharing this piece. Amen and may God bless you too in Jesus' name. Great lessons abound in this post. But I am saddened because most persons would not derive pleasure in reading such post. They rather prefer to read very long pieces on entertainment and sports. I do not disapprove of that but I would that greater attention should be payed to such eye- opening posts as this. Today, most people, particularly the youth are anxious to know what the future holds for them. As a result, they cut corners. They visit medicine men. they spend alot .And when they are told what the future holds, they accept. But after some years, they discover there are no progress made. Instead, their situation become worse than ever. This has become a huge problem. People have lost their faith in God.t hey feel He is too far away from them. We need to place greater trust in God so that people will not take advantage of us because of our fears. Praise God! We can trust Him for He holds the future in His hands. Curiousity they say kills the cat. I am very guilty of this, often times i am idle thinking of what the future holds for me forgetting that whatever i do today sets the path for my future tomorrow and that i need to take one step at a time. Thank you for this piece Aunt Edith, i know now to be obedient to God's words and follow his directions and my future will be great. Luv u ma. Love you too. We just trust God, that's all! And also with you, my dear! ma'am, i'm really grateful for this writeup because i was also caught up with thinking of my future but this writeup has inspired me to trust God. Praise God! And bless you, Mercy! Curiosity to know the future is what pushes some people to visit the future tellers, I mean soothsayers. Some visit all kinds of fortune tellers, witches. All these to know what the future will be like. But we have to remember an old Igbo adage that says: there's no need pinching a package that will still be opened. Curiosity, they say, killed the cat. Eagerness to know what the future holds is what got some people into trouble today. Some people are suffering different afflictions, some are regretting. They wished the hands of time could be reversed. And like my brother said, there's no need pinching a package that will still be opened. 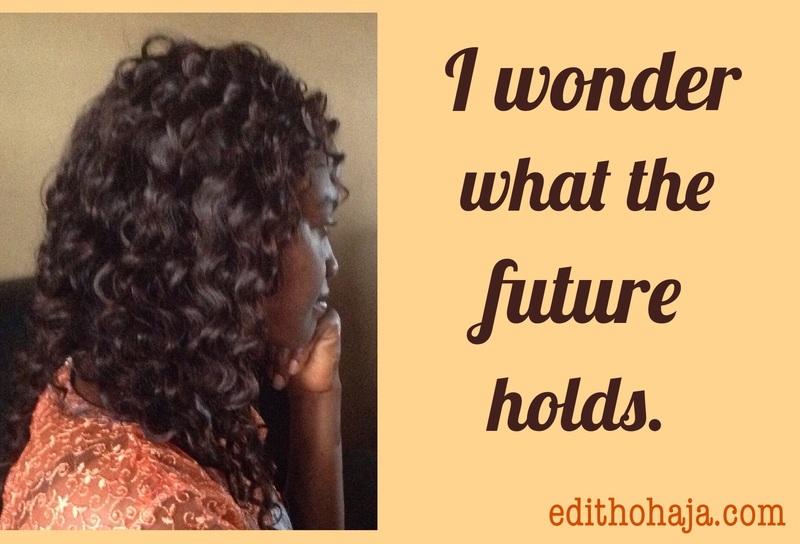 Why inquiring about the future when we will still approach the future? Why indeed? May God protect us from idle curiosity and anxiety about the future in Jesus' name. Yes, my dear, only He alone can truly tell the future. Patience, I believe, is one of the bullets that kills curiosity in one's life. You know, I think you have your daddy's knack for coming up with wisdom nuggets. Keep it up, my dear! This is actually the trend lately "to always inquire into the future". the truth is that when this happens, the taste of life is gone and no one will actually bother to work hard, be careful and trust in God. trusting and hoping unto God is the ultimate in life and remedy to our problems. Everyone needs to know this. Very true! Bless you, Chisolum! God bless you, ma! Right now, I am under a travail which has cost me sleep and peace of mind. I trust God but I was contemplating whether to see a doctor. But this word at this very hour has answered my enquiry. Indeed, God has made me know you for this reason. Praise God! I pray that you get the relief you need speedily in Jesus' name. I guess everyone experiences anxiety while trying to figure out what the future holds. But with God's assurance, I'm certain the future holds great and mighty things for those who believe. Humans are naturally curious, especially about their existence and what the future holds for them. This is why prophetic churches are flooded with curious people. They forget that what u do now affects ur future. Just believe in God and take the journey to ur future easy. God bless u ma. 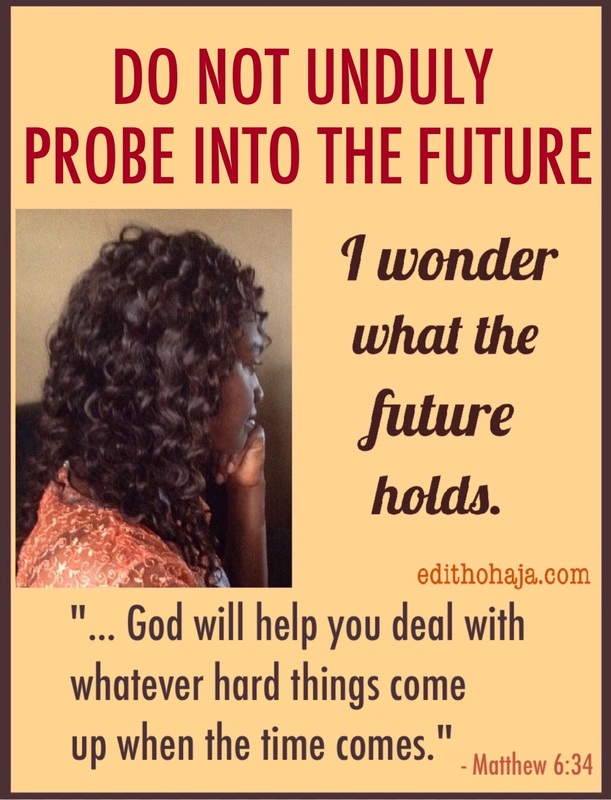 why should anybody who believes in God probe into the future . God has promised to take care of our tomorrow, so why worry, why being curious. Thank you. I have trouble not to "check my horoscope" I don't do that exactly but something like it. This was well written. Thank you, Angela! God bless you! we are always in a hurry to know what tomorrow holds, before we even go into it. i am guilty of this issue also and i pray for sufficient grace, to handle this. wonderful post ma! Thank you so much for sharing this.We humans like peering into the future because we want to know what it holds for us and by so doing we tend to go extra miles both consciously and unconsciously..May God help us in Jesus name. Truly, we all want to know what the future hold for us .Most especially the youth, we just sit down fantasizing on how tomorrow will be, how our spouse will look like,how loaded our account will be and the rest of it.Well its normally but does it warrant us to go and seek help from medicine men and those people that claim that they can see the future? No .The only thing we can do as Christians is to trust God and work hard to achieve a better future. When we want a peak into what tomorrow holds, that is a slap to God. It shows we dont trust His leading and want to make out our destiny. I believe my day to day workings are directed by God towards achieving purpose, so i patiently wait on his time. Impatience and hunger to hit big soon drives men to probe into the future and that's bad i should say. Amen.This is a lovely piece Ma,I think as Christians we Should focus on God's guidance for the future and not on any man,we should engage the scripture also. As children of God we should not go around looking for future takes because we have someone who holds our past, present and future in his hands and he will never forsake u until that contract is signed sealed and delivered.